There is no better training for murder than the traditional one-set, five-character stage thriller. Just ask Sidney Bruhl in Death Trap. Maybe he isn’t such a good example, but Michael learned from the best: Dame Agatha. Years ago, his late friend Neil directed a hit summerstock production of The Mousetrap, featuring several of his selfish so-called friends. 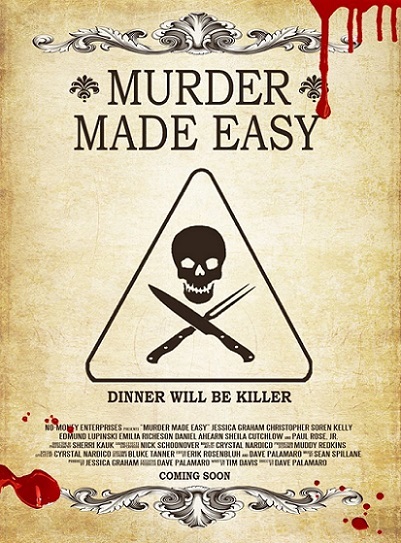 To settle scores, Michael will move the homicidal shenanigans from the stage to real life in David Palamaro’s Murder Made Easy (trailer here), which screens during this year’s Dances with Films, in Hollywood, CA. It is the one-year anniversary of Neil’s death, but Michael and his widow Joan have clearly not moved on, despite the obvious sexual tension percolating between them. They both bitterly resent the betrayals of his friends, such as the hammy Marcus, whom is expected for dinner shortly. When he arrives, it is game on. Henceforth, there will be twists and turns, shifting loyalties, and a mounting body count. MME is clearly a fond homage to old school stage and film thrillers, such as Death Trap, Sleuth, and Wait Until Dark. It directly refers to The Mousetrap, but Michael’s Nietzschean pretensions also clearly echo Rope. In any event, it is a great deal of fun watching Palamaro and his on-the-money cast drop one shoe after another. Co-leads Christopher Soren Kelly and Jessica Graham nicely carry the picture, appearing on-screen together nearly the entire way through. Yet, they still manage to surprise us. Kelly (who was also terrific in the criminally under-heralded Infinity Chamber) is all kinds of sinister, but he also makes the most of some wickedly droll dialogue (especially when skewering the hippy dippy Cricket). As Joan, Graham is a femme fatale to die for. You expect to have reversals and revelations in a film like this, but Palamaro and screenwriter Tim Davis still manage to fool us through some clever magician-style misdirection. It is a neat single-location thriller that will be especially entertaining for viewers that appreciate the tradition. 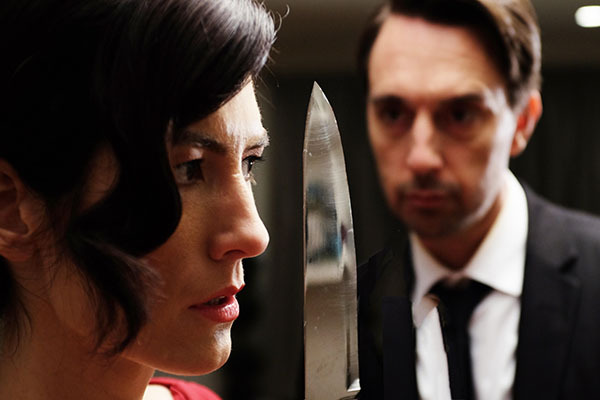 Highly recommended, Murder Made Easy screens tonight (6/14), as part of the 2018 Dances With Films.